Imagine you are going about your business one day and as you take your next step you find yourself in a field you've never seen before. When you step back, you find yourself back home. The Long Earth explores the possibility of parallel earths that are just a step away from our own. Once this phenomenon of "stepping" has been discovered- people all around Earth 1 "The Datum Earth" start wondering what is out there on the Long Earth and how it will change civilization as we know it. The main characters, Joshua - a natural stepper, and Lobsang - a super intelligent computer, in particular have a desire to explore the entirety of the Long Earth in an attempt to figure out why it's there. My thoughts: There were a lot of really cool concepts in this book as well as a lot of things that didn't feel quite developed enough. The idea of The Long Earth and the consequences of its discovery is really awesome. Some immediate consequences were that people were stepping away from their lives to run away from their problems- one day they just stepped away from everything and just kept walking into the unknown. Other people and communities saw it as an attempt to restart civilization on a random Earth and see if they can do any better than what is on the Datum. The idea of an infinite number of Earths was really neat as well- because on each one, things were slightly different than the one before because evolution took a slightly different path. But some things didn't feel like they were wrapped up completely... (and I cannot find evidence if there will be a second book or not). In fact, I really hope there is a second book because if this is a stand alone then I am pretty disappointed in the ending. If it is the beginning of a series/trilogy/something then I can see how this was just the setup for things to come. Why I gave it a 3: As I mentioned above, the ending didn't feel resolved. Also, sometimes while I was reading I kept wondering "okay so where is the plot?" I get that Joshua and Lobsang were trying to travel to Earth Million (and beyond) to try and figure out why The Long Earth existed... but really that's all it was- they were traveling with small glimpses of the strangeness of what was below them. I don't know if maybe I was missing some greater point of "No really, what is the point of all of this" or if it really was lacking a bit plot wise. That being said it wasn't a bad book- the characters were enjoyable and so were some of the oddities they stumbled upon. I hope there is a continuation that really explores what has happened to the Datum earth now that the majority of people have fled to restart their lives. All in all, I think it's an interesting beginning to something- I just hope it's actually getting continued. The premise sounds really interesting but I'm skeptical. It'd have to be a really well developed story to hold my attention. Also, it kind of reminds me of the film Another Earth. Have you seen it? Are they at all similar? I haven't seen the movie- but I'm interested to check it out and see if they are at all similar! It seemed like a great book (the basic idea is just amazing) but if it is not fully developed, as you mention, then it is not so worth reading. 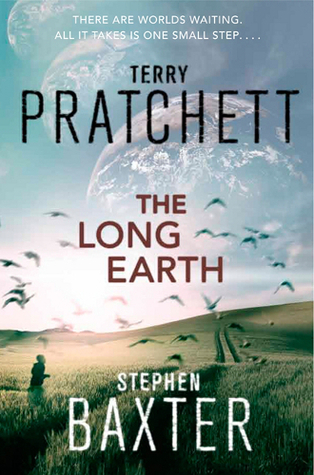 So far, I've not been reading reviews/descriptions on this book because I'm not really a Pratchett person. But I read your review anyway and the premise sounds good. It reminds me a little of the Stephen King book 22/11/63 but only for the bit where you can just step into a different time/earth. A pity it wasn't quite so good as you'd hoped. I'm tempted to try it, though. The idea behind this book sounds really, really good. It's a little sad that the execution didn't really meet the expectation set by the premise. Happy 2 Years To Us + Giveaway FOR YOU! Daisy's Top Ten Books On The Summer TBR List! Top Ten Tuesday Rewind With Jamie!